Two men in a homestead facing away from the camera beating narrow hide-covered drums (one longer than the other) with a beater in their right hands. The beating of drums accompanied dances in homesteads on certain occasions, such as marriage celebrations. They are described as Jikul which is lineage or clan name not associated with one tribal territory, but which was a significant lineage around Nyueny and surrounding villages in Leek country, but also elsewhere such as Western Jikany. Note on print reverse ms pencil - "3 Jikul" & print front border ms ink - "NUER IV/100"
Morton, Chris. 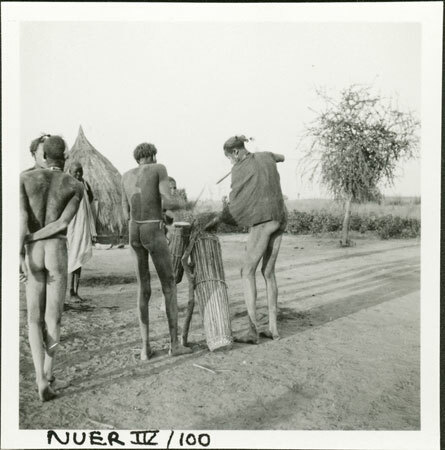 "Nuer dance drums" Southern Sudan Project (in development). 03 Jan. 2006. Pitt Rivers Museum. <http://southernsudan.prm.ox.ac.uk/details/1998.355.198.2/>.